Digrain Insectaclear C Food Moth Killing Insecticide 5ltr is the best and most effective pesticide product for killing and getting rid of stored food product moths species including Ephestia and Plodia [ Warehouse / Tobacco moth & Indian Meal moth). 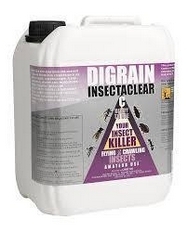 Digrain Insectaclear C Food Moth Killing Insecticide kills all stages of moths - the eggs, larvae and adult insect. This product leaves a residual layer that continues to work for upto 4 weeks after the initial spray treatment.